With peach season coming to a close, I figured I’d round up the last of the peaches I have and enjoy them while they’re still good. 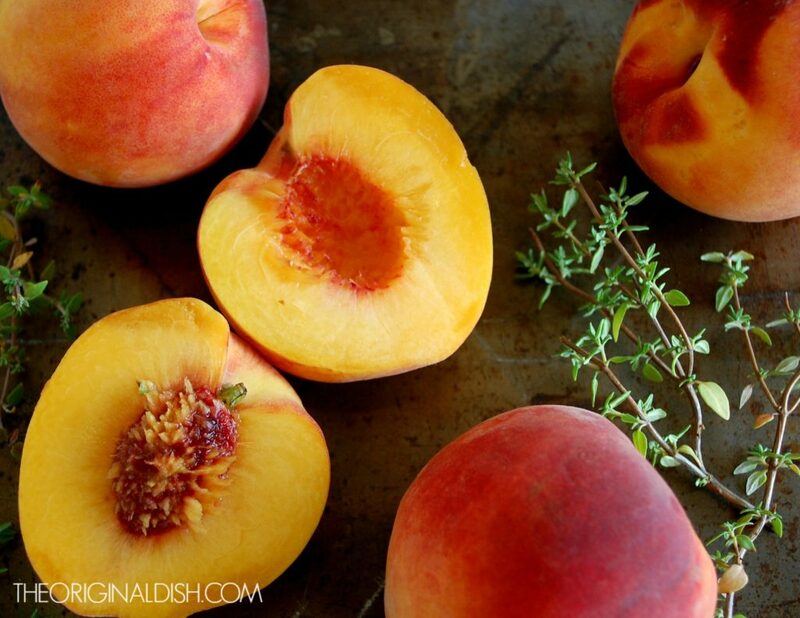 Peaches, like many stone fruits, are extremely versatile. They’re commonly found in desserts or breakfast dishes, but they can be used with savory ingredients as well. 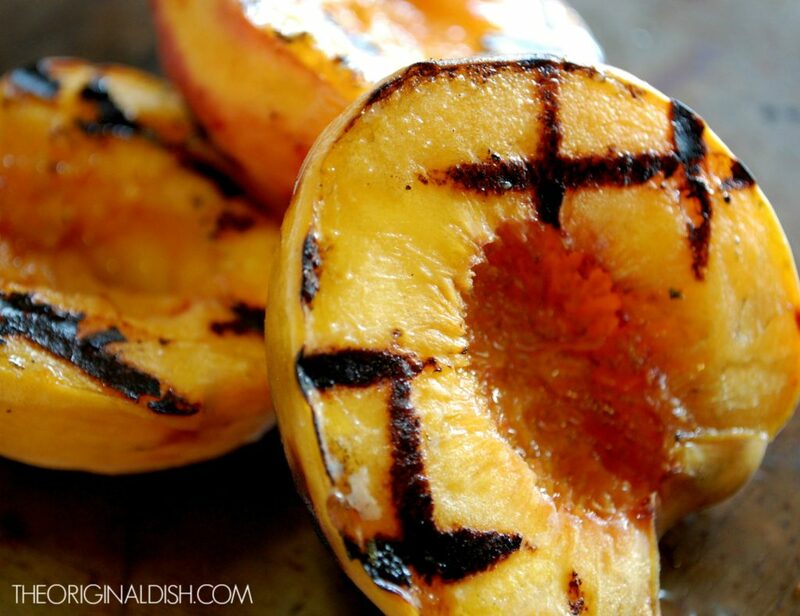 I grill peach halves to extract as much flavor as possible, caramelizing all of the natural sugars within the fruit. 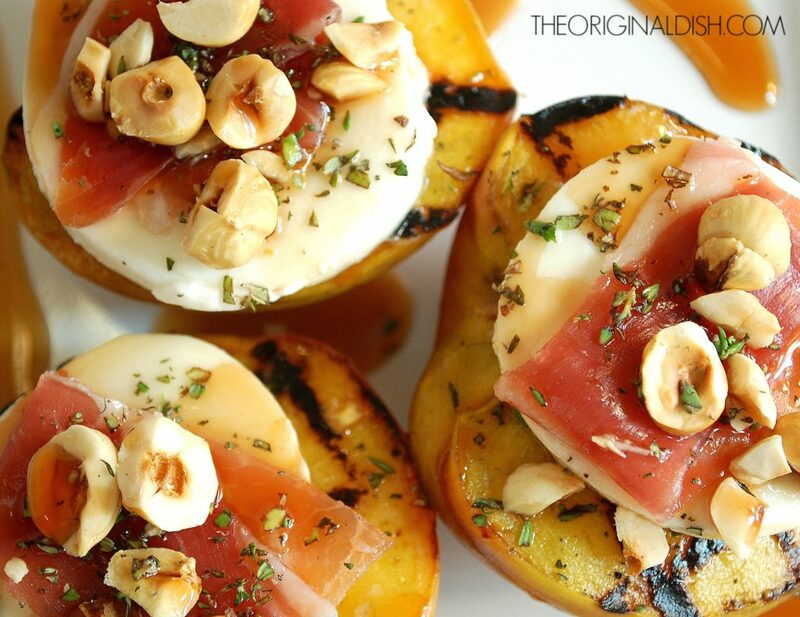 I top each peach with a slice of fresh mozzarella cheese and a piece of salty prosciutto. The sweet and salty combination, plus the creamy cheese, brings the peach to a whole new level. For a little crunch, I top each peach with roasted hazelnuts. You can even roast the nuts at home following a few simple steps. For the final touch, I infuse Marsala wine with fresh thyme and reduce it down into a syrup that gets drizzled over the entire dish. 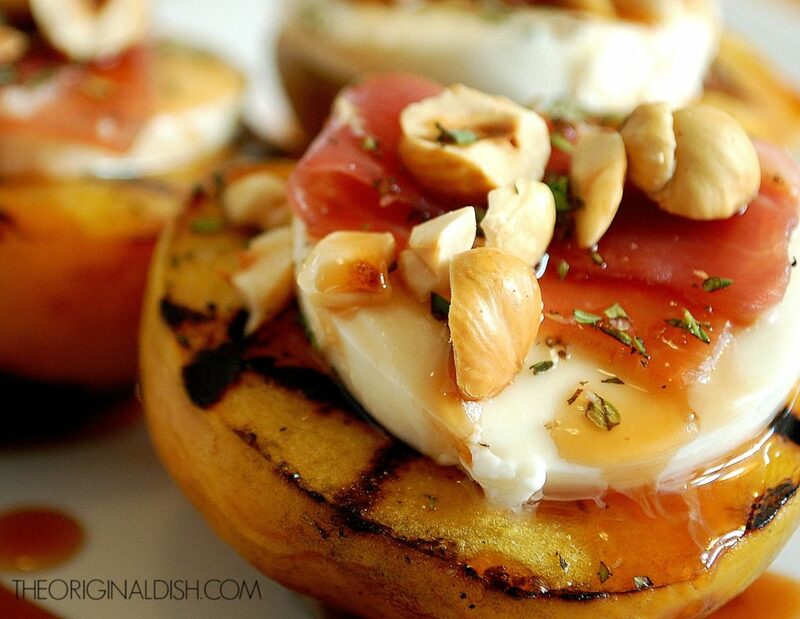 Find peaches to use that are pretty firm so that they don’t mush up on the grill. You want them to be soft and caramelized, but not so much that they fall apart. Preheat the oven to 350°F. Roast the hazelnuts on a sheet pan for 10 minutes, turning the pan half way through. Remove the nuts from the pan and pour them onto a clean kitchen towel. Let cool for 5 minutes. Fold the towel over the nuts and rub them until their skins flake off. Discard the skins. Roughly chop the hazelnuts and set aside. Combine the Marsala, sugar and sprigs of thyme in a small saucepan over high heat, stirring until the sugar dissolves. Bring the mixture to a boil. Reduce to a simmer and cook the Marsala down by half, about 30 minutes. Meanwhile, heat a charcoal grill or set a gas grill to medium-high. Drizzle the peaches with olive oil and place the flat side down on the grill. Cook for about 30 seconds, just to get nice grill marks, turning them 90° half way through. Lower the heat and turn the peaches over. Cover the lid. Cook for about 3 more minutes so that the peaches soften but are still firm. Remove from the grill and season with salt and pepper. Cut each prosciutto slice into 4 pieces. 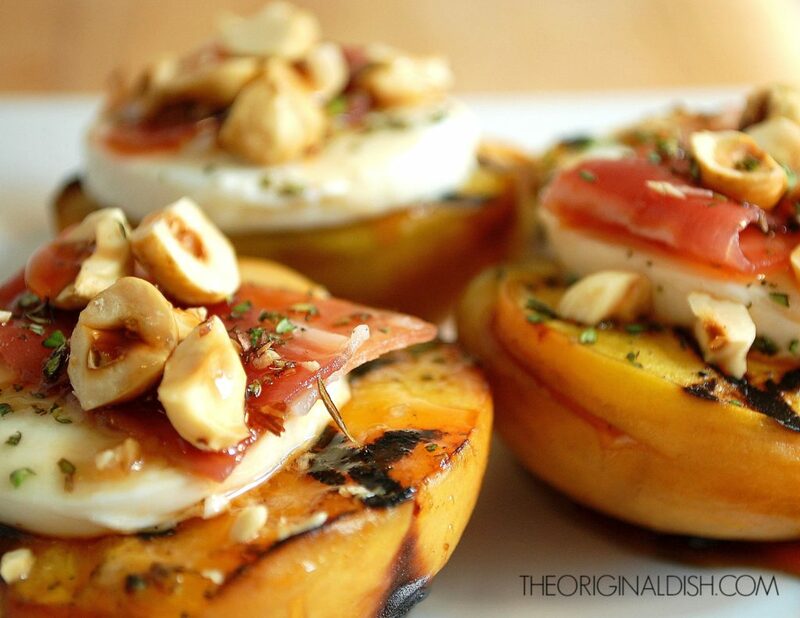 Serve a grilled peach with a slice of fresh mozzarella, a piece of prosciutto, roasted hazelnuts, and a sprinkle of fresh thyme. Drizzle the Marsala syrup over the top. Alternatively, pour the hazelnuts into a zip-lock bag and shake the bag until the skins flake off. Either way, the skins will not come off entirely, which is okay!